A thumb injury has prevented the Bayern Munich ‘keeper from returning to action. 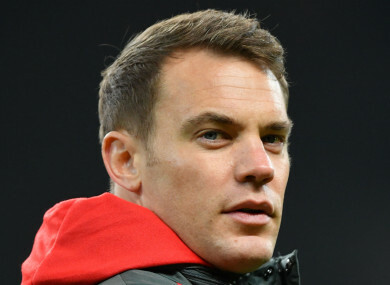 MANUEL NEUER WAS not deemed fit enough to be included in the Bayern Munich squad to face Hertha Berlin in the DFB-Pokal tonight as concerns grow over his availability to face Liverpool in less than two weeks’ time. Bayern’s skipper missed the weekend defeat to Bayern Leverkusen because of a hand injury sustained in training, and though he travelled to the capital ahead of the cup clash, he was not included in the squad. Sven Ulreich, who will start between the posts for Bayern in Neuer’s absence, said the club’s first-choice stopper had a thumb injury and reports have suggested that potential ligament damage could result in Neuer spending up to three months sidelined. The first leg of Bayern’s Champions League tie with Liverpool will take place on February 19 at Anfield, with the return leg at the Allianz Arena three weeks later. It has already been confirmed that Thomas Muller will miss both matches after his two-match suspension was upheld by UEFA. Muller was sent off for a foul on Nicolas Tagliafico during the 3-3 draw with Ajax in December. Liverpool, meanwhile, will be without star defender Virgil van Dijk for the first leg after picking up three yellow cards in the group stages, resulting in a one-match ban. Email “Injured Neuer remains on sidelines as Liverpool tie looms”. Feedback on “Injured Neuer remains on sidelines as Liverpool tie looms”.